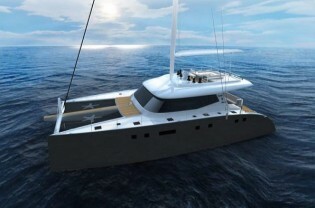 Sunreef to launch its first Sunreef 80 Yacht this summer – Superyachts News, Luxury Yachts, Charter & Yachts for Sale. Calculations made by the FEM (Finite Element Model) helped reducing the sound and vibrations to the minimum with a very sophisticated system. The lightweight structure and sleek and sporty line of Sunreef 80 yacht will guarantee high performance under sails in keeping with the fully customized design and layout. The wet deck is now being painted. The teak flooring has been installed on the flybridge as well as in the cockpit. Most of the rigging has also been fixed while interior finish in modern style is now being mounted within the superstructure and the hulls.